The Thompson Submachine Gun is probably on every gun owner’s “Lottery List,” and for good reason. It’s a blast to shoot. Big thanks to Guy Smalley for letting me shoot his Tommy Gun and to John P. Richardson for working the camera. Plus I now know that we can rent a bay at the Wake County shooting range for $45 an hour. That’s not a single lane, that’s an entire bay, 8 lanes, max range 100 yards. I can also check out a local outdoor range and see what they want to rent their 200 yard outdoor range, complete with a two story shooting platform. Who lives close to Raleigh, NC who would want to get involved? You don’t have to be a blogger, just a person who is safe with a gun. 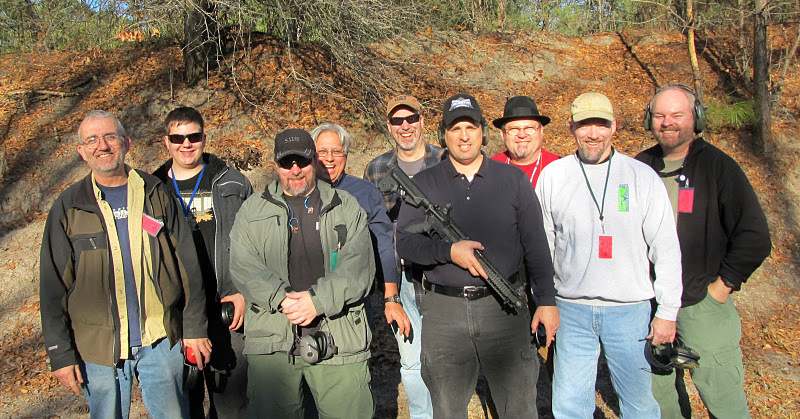 Appleseed – Bloggers and readers are invading the March Appleseed shoot! Sign up at the Appleseed site. The cost is about $75 for men, with various discounts available for military and re-enactors. Women shoot free. 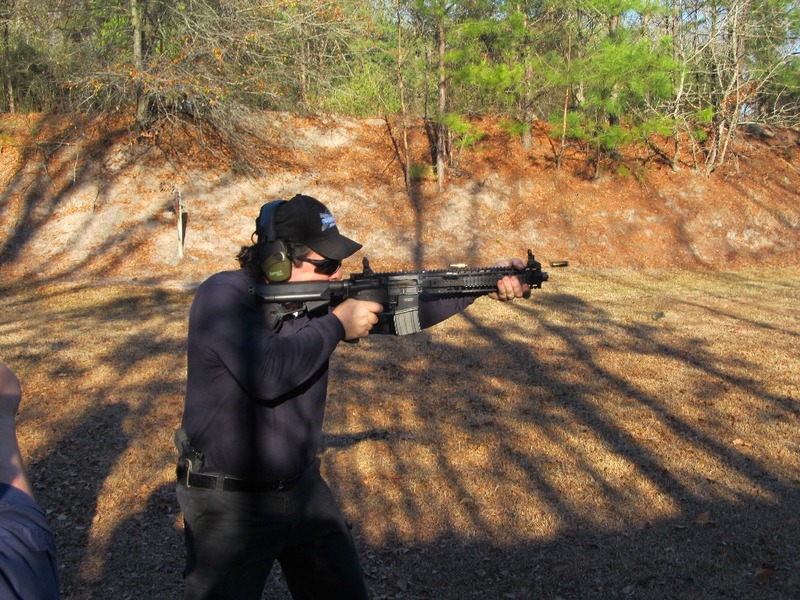 TigerSwan – Introduction to Pistol class. 8 hours of first class instruction with former Special Operations members. April 28th – Stedman, NC. Cost is $210 for the class, or $340 for the class, pistol rental, and ammo. Email me for payment option. For those who have already said they want to go, now is the time to get your money in! Both of these opportunities are closing out fast. Get onboard now. As regular readers will know, I spent some of my filthy lucre from the proceeds of the Gunwalker T-Shirts (I still have some, order now!) on a Ruger 10/22 that I’ve turned into a Liberty Training Rifle. It’s got really cool military style sights on it and the best trigger you can imagine in what is essentially a plinker rifle. Now it’s time to take that rifle and learn how to shoot. I got an email from Chris at Arma Borealis. He’s moved to the Carolinas from his home in Alaska and he and Heather want to go to Appleseed. Do I want to go? Ohhh yeahhhh! This is an open Appleseed shoot at their home range in Ramseur. The first day will be rifle training at 25 yards, learning to shoot properly with cheap .22 ammo. The second day will be shooting full power, centerfire rifles out to 400 yards on their full distance AQT range. Costs are relatively cheap. Men get charged $70. Women get charged $10. Under 18 is $5. Military, law enforcement, uniformed re-enactors, etc, FREE! Lots of info at their main site. When you sign up, send me an email. I’d like to know how many people are showing up. You are looking here at my next rifle. This rifle is the personal rifle of Bob Reynolds, of Templar. He built it last week and brought it along to the Blogmeet in Greenville. I got to shoot it and I want one. I think that the only think I might change is the stock. This particular onehas a 16 inch barrel and is chambered in .223 Wilde (a hybrid 223 Remington/5.56 NATO) that will shoot basically every normal 223 and 5.56 ammo available. The rail is Bob’s proprietary FastRail system. This particular one is 14.5” long. It allows you to remove the barrel in about 2 minutes, and replace it just as fast. If you have spare barrels, you can change calibers, barrel lengths, or both. I will do a later post about how well it shoots, but suffice it to say that it is far more accurate than I am. If you want your own rifle, ask Bob. He’ll build it just the way you want it. 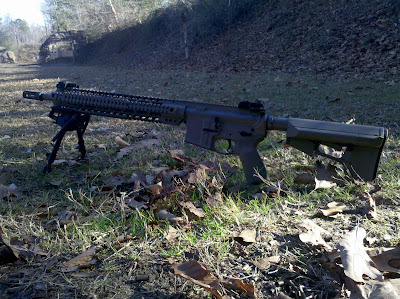 If you already have a rifle, and just want to have this really nice rail, you can buy one here. UPDATE: Accuracy test with barrel remove/reinstall. Friday I was invited by ASM826 of the blog “Random Acts of Patriotism” to his blogmeet and shoot near Greenville, NC. Along with ASM and me, Borepatch showed up and Knightbane showed up. We had various friends along. The rifle I am holding is a full auto short barreled rifle chambered in .50 Beowulf. Here’s an action shot of me shooting it. I count 3 pieces of brass in the air, and one being ejected. Let me assure you that the photo makes me look a whole lot more in control of the rifle than I felt. Cartman looked worried in this photo. He had good reason. 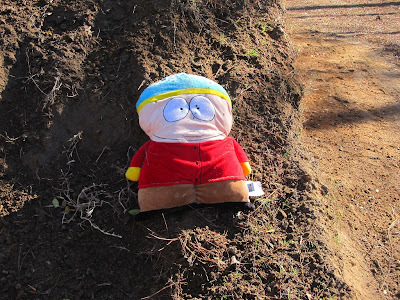 Hopefully one of the other bloggers got a photo of Cartman after the shoot. 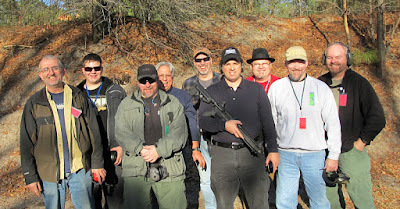 Thanks to ASM826 for coordinating this fantastic range trip/blogmeet. I’ve had a few discussions and it looks like April 28th is the best date to hold the next Intro to Pistol class at TigerSwan. 10 of us took the class in October and we were very happy with it. So happy that several of the students have been telling me to run another class. TigerSwan is owned and operated by former members of Delta Force. More than that, they select their instructors not only for their ability to shoot, but also for their ability to TEACH shooting. Shooting is pretty easy. Shooting well isn’t very hard. Teaching how to shoot is a very difficult skill. These guys have it. Here’s a page with links to all the other bloggers who attended. Read what they had to say about their class. The class is a one day, 8 hour, 500 round introductory pistol class. It is suitable for rank beginners, but even skilled shooters will learn something. If you can tell the difference between the holding end and the flaming death end of a pistol, these guys will have you shooting well by the end of the day. If you have any questions about your ability to complete this class, email me and we’ll talk. Some of you might be thinking, “Sean, I don’t even have a pistol.” No problem. 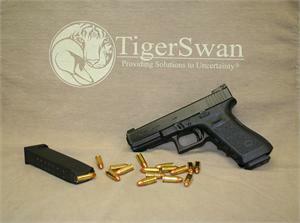 TigerSwan will loan you one of their Glock 17s and all the things necessary to complete the course. They charge an extra $130, mostly to cover the costs of the 500 rounds of 9mm ammo you will be using. That’s a steal. We have a absolute limit of 15 people for this class, so sign up early. Email me with any questions you have. You have three options for payment. 1. Send me a check or money order by mail. Email me for my postal address. 2. Pay TigerSwan directly. Make sure you tell me that you are doing this so I can warn the TigerSwan people. If they get random money in the mail, they will not add you to the class. 3. Pay via PayPal email me for directions. I have to charge $5 extra for PayPal to cover PayPal fees. I look forward to seeing you at the class. Are you ready for MORE TigerSwan? It’s kind of like More Cowbell! You can’t ever really have too much. I’ve been getting some questions about running another Intro Pistol class, and here’s the possible dates. Again, the class itself is $210, but if you pay by Paypal I’m going to charge you another $5 to cover Paypal costs. If you want to use their Glock 17 and ammo, it’s $340. UPDATE: April 14th has been eliminated as that is the weekend of the NRA Convention. When several bloggers, readers, and I took our Intro Pistol class in October at TigerSwan, several of us got a chance to shoot this gun. It’s a Glock 17, the full duty sized 9mm pistol, but with some added components. If you consider that the sights alone will run you about $105, and the barrel $165, you are already above the $760 asking price for this Glock. There was a problem, however. I like the Glock 17, but it is a tiny bit large for concealed carry. I inquired, and Bryan Searcy has agreed to make a Glock 19 version available with all the same components for the same price. He says you can have it on a Gen 3 or a Gen 4 base, and you can have it in full size Glock 17 or compact size Glock 19. When you consider that Brian recommended that civilians carry a 9mm with hollowpoints as their concealed carry gun, and how nice his pistol was to shoot, I can see myself getting their Glock 19 here in the near future. When we run the class again in the Spring, I think I will be shooting this gun. TigerSwan doesn’t have their Glock 19 on their website. Contact them directly for more info. If you happen to live in the Raleigh area, they are perfectly happy to let you buy the pistol from them at their Apex corporate headquarters, saving you the trip to their Fayetteville area range and pro-shop. It’s been a week, and now it’s time for me to write my final evaluation of the one day Introductory Pistol class at TigerSwan. First, some background. I have always been worried that I would spend my hard earned money, get to a shooting class, and find I had paid my money to a charlatan. If you get rooked by a crappy woodworking teacher, the worst that can happen is that you might waste some perfectly good wood while you don’t learn proper techniques. If you pick the wrong firearms instructor you could get shot because they insist on “playing by the Big Boy rules.” I resisted taking just any class, and I didn’t have the money to travel out west to take a class at Gunsite or some other really big name location. When Tam linked to TigerSwan, I saw that they had former members of the unit commonly referred to as Delta Force. Through my historical re-enactment, I just happen to know a former Delta member personally. In response to my email, he vouched for them being who they said they were, and he also said that they could teach well. That was good enough for me. Two years ago I took the Intro pistol class and was really impressed. My shooting improved dramatically. I could shoot much further, much more accurately than I ever had before. More than that, once I got home, I could see what others were doing wrong and I started to give a little coaching to my friends and saw their sudden improvement in accuracy. It wasn’t rocket science, it was just good fundamentals. Flash forward to the LuckyGunner machine gun shoot. During the LuckyGunner shoot we were treated to a free class by a well respected trainer. He was good; I can’t take anything away from him. But he was rushed. He didn’t have the time during that busy weekend to do more than give us a taste of what he offered in his classes. The problem, other than the time limitations, was the appalling shooting skills I saw on display. Most of the bloggers weren’t any better than me, and many were really poor shots. I just wanted to take them all to that one day pistol class I took two years prior. So I set up the blogmeet/shooting class. The class was everything I thought it should be. Everyone improved. I proved to myself that my precision shooting hadn’t deteriorated much, even though I still have trouble with multiple shots. I have a certain satisfaction that 9 more people are running around with better shooting skills. I also know that the moment I say “Hey, let’s take a two or three day class,” I’ll have a bunch of people saving up their pennies to come along with me. Here’s the bottom line. Get training. Go somewhere reputable. If you are close enough to come to TigerSwan, go there. They are reputable, they are good at instruction, and they are really professional. You will learn how to shoot with little in the way of fuss or fanfare. You will find out what you are really capable of, and it is so much more than you think. And it won’t break your bank. For $340, they’ll teach you the class, give you 500 rounds of ammo and loan you all the gear you need. And when you get home, you’ll shoot better than all your friends. My roundup of posts from the other bloggers at TigerSwan is HERE.